The original jersey. This would be the Warriors inaugural jersey. The original logo was designed by Francis Allan from the Advertising company Colenso and was released in August 1992. The first tekoteko featured a straight tongue however Warriors CEO at the time, Ian Robson, and Marketing Manager ,Liz Dawson, decided that a curved tongue looked more striking. Unbeknown to both the curved tongue was actually a sign of femininity and showed a lack of courage. The colours of blue, white, green and red were a cross of the Auckland Rugby League's traditional colours and the colours of major sponsor DB Bitter. DB Breweries paying close to $1.5 million a year for the rights (some early reports suggested $4 million!). 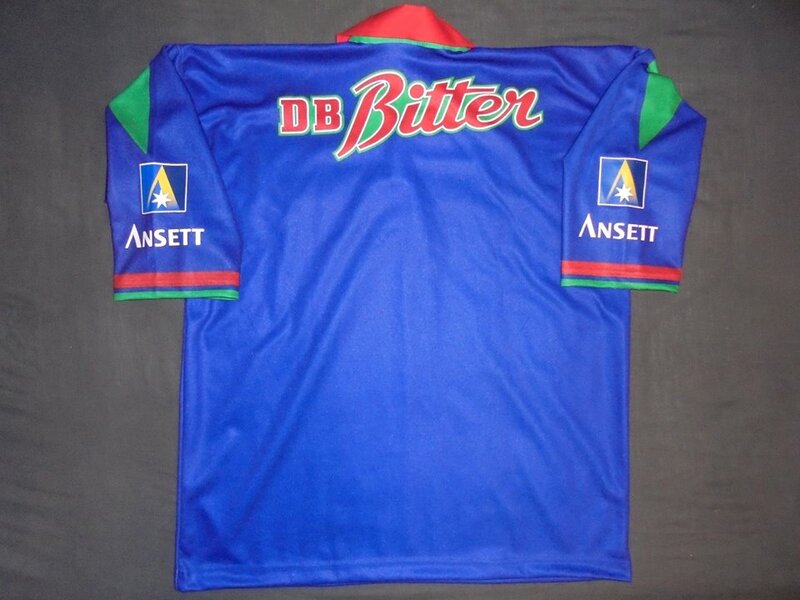 In May 1993 Ansett was announced as the official Airline to the Warriors and the sleeve sponsor on the jersey. Although at the time they weren't yet flying Trans-Tasman the offer they bid far surpassed that of Air NZ. The main difference between the 1995 jersey and the ones preceding it was the use of the Australian Rugby League (ARL) badge. The ARL having been established that very year. Official supplier was CCC. Despite being the official replica the Canterbury version wasn't as widely available as other suppliers. This jersey isnt all that common and a one in good condition is very hard to find. 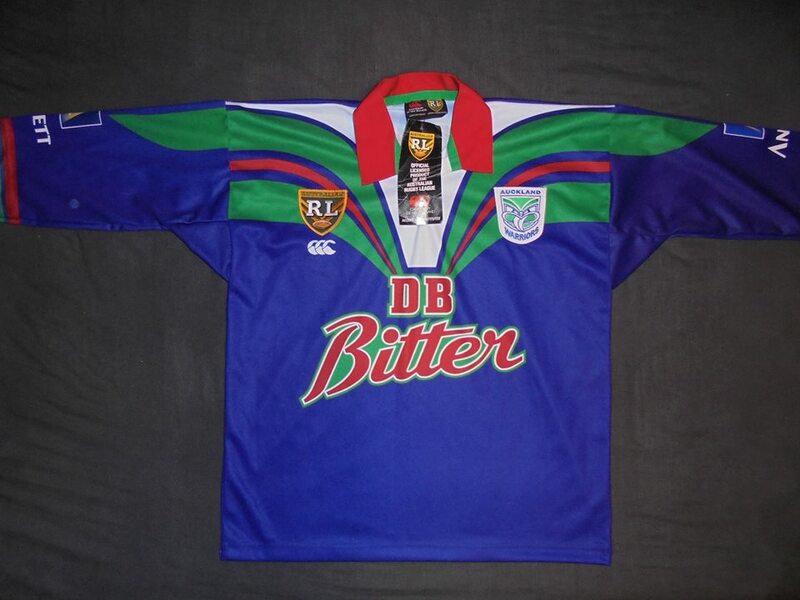 Up until 1999 the ARL/NRL owned the manufacturing rights to teams jerseys and would sell licences to producers. 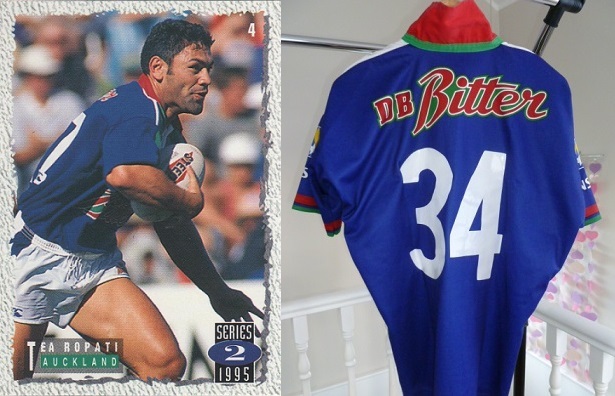 By far the most common version of the original jersey that was made was produced by Lenco. Some 90% of all 1995 jerseys that come up for sale on online auction sites will be of this variety. Other makers included Sport M, Peerless, Peerless New Zealand, Oddfellows, etc. These jerseys are always coming up for sale and arent particularly rare. The Warriors used a couple different jerseys and its really hard to tell the real from the fake. Some were exactly like the replicas but with shorter sleeves while the main type had the CCC logo in blue and on the white area around the neck. Numbers were sometimes just plain white, had the CCC logo at the base or a mixture of both.